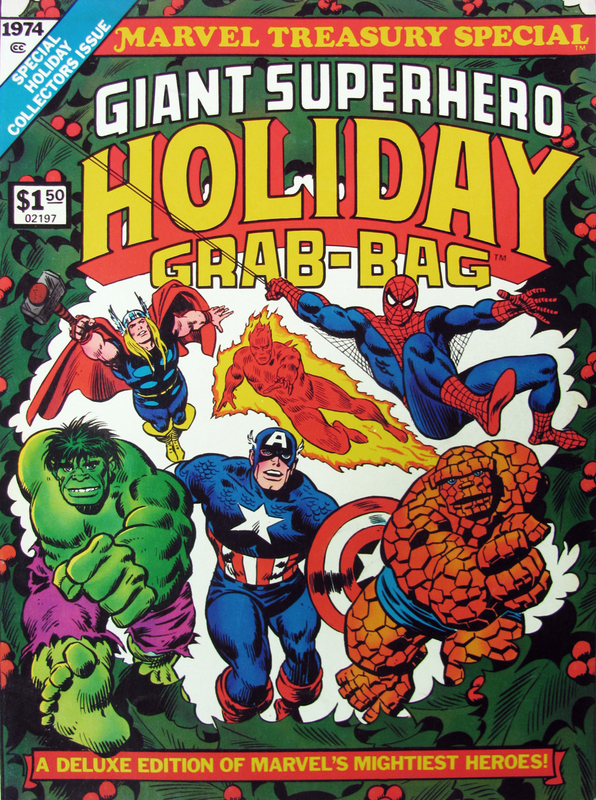 Marvel Treasury Special: Giant Superhero Holiday Grab-Bag (1974) | 'TAIN'T THE MEAT… IT'S THE HUMANITY! In the mid-1970’s Marvel Comics began to experiment with reprint collections featuring some of their back catalogue of classic stories. The success of the softcover books they published in conjunction with the Simon & Schuster imprint Fireside Books emboldened the company to try their hand at releasing reprints themselves, under their newly created Treasury banner. Between 1974 and 1983 Marvel published almost 50 books under three variants of this new reprint label: Marvel Treasury Editions; Marvel Special Editions and Marvel Treasury Specials. I’ve no idea why Marvel used different headings for these books, but I suspect they were experimenting with the newly created reprint format and were seeing which heading attracted the most attention from buyers. Despite the difference in labels the books followed the same format: oversized reprints measuring a generous 10 x 13.5 inches that were printed in full colour and ran from 80 and 100 pages in length. The books featured thick cardboard covers and sold for $1.50, or 50p in the UK. Published in time for the Christmas holidays of 1974 the Giant Superhero Holiday Grab-Bag was Marvel’s first Treasury Special Edition, ran to 100 pages and featured five classic reprints: “Have Yourself a Sandman Little Christmas!”, reprinted from Marvel Team-Up issue #1, originally published March 1972; ‘In Mortal Combat with… Sub-Mariner!“, from Daredevil issue #7, April 1965; “…And to All a Goodnight”, from Amazing Adventures featuring The Inhumans and The Black Widow, vol 2, issue #5, March 1971; “The Hulk vs. 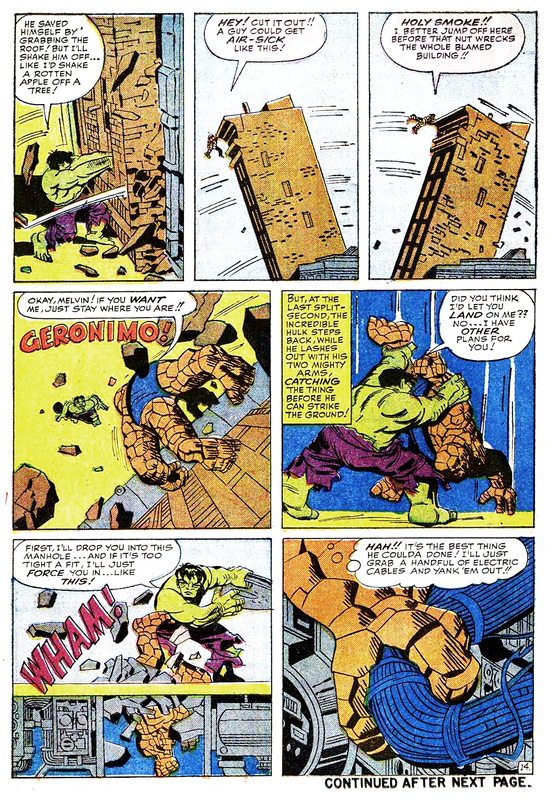 The Thing”, from The Fantastic Four issue #25, April 1964 and “The Avengers Take Over!”, from The Fantastic Four issue #26, May 1964. 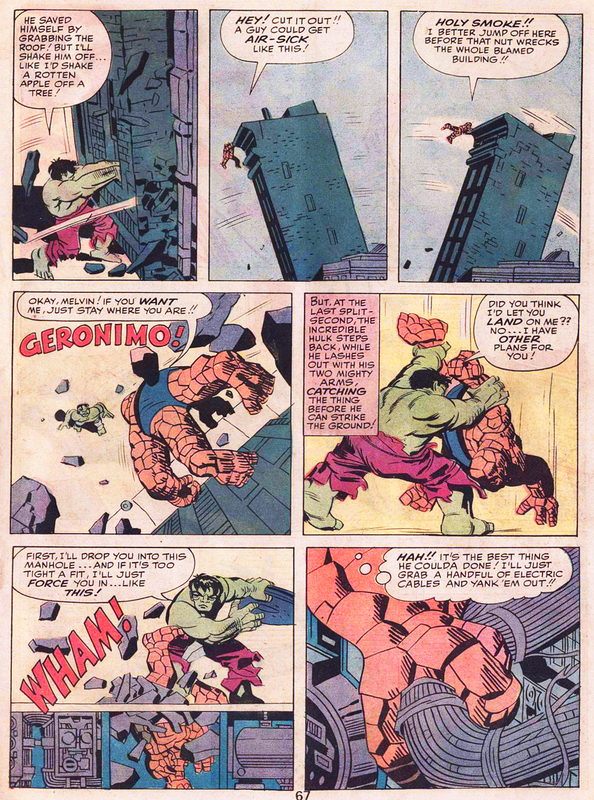 The eye-catching front and back covers were pencilled by John Romita and the collection featured a contents page on the inside front cover and a cover gallery on the inside back. In order to fit the reprints into the squarer proportions of the Treasury Editions modifications had to be made to the original stories, with panels being trimmed slightly to make room. This cropping is barely noticeable though and is no where near as intrusive as the trimming utilised in The Spectacular Spider-Man #1 Special Edition published a few months later. And unlike that collection, Marvel didn’t need to delete any pages to shoe-horn the stories into the Grab Bag’s 100 pages. And although some of the stories featured here have been recoloured, it’s not to the detriment of the reprints themselves. Although this collection was clearly aimed at the Christmas holiday market only two of the stories – “Have Yourself a Sandman Little Christmas!” and “…And to All a Goodnight” – actually have a holiday theme. Despite that the other stories in this book, particularly the pair featuring The Fantastic Four, are bone-a-fide classics and richly deserve the oversized Treasury treatment. I’ve mentioned in other articles how fond I am of these Treasury Editions. Unlike most US comics they were readily available from British newsagents in the Seventies, especially at Christmas time, so I always received at least one as a present. 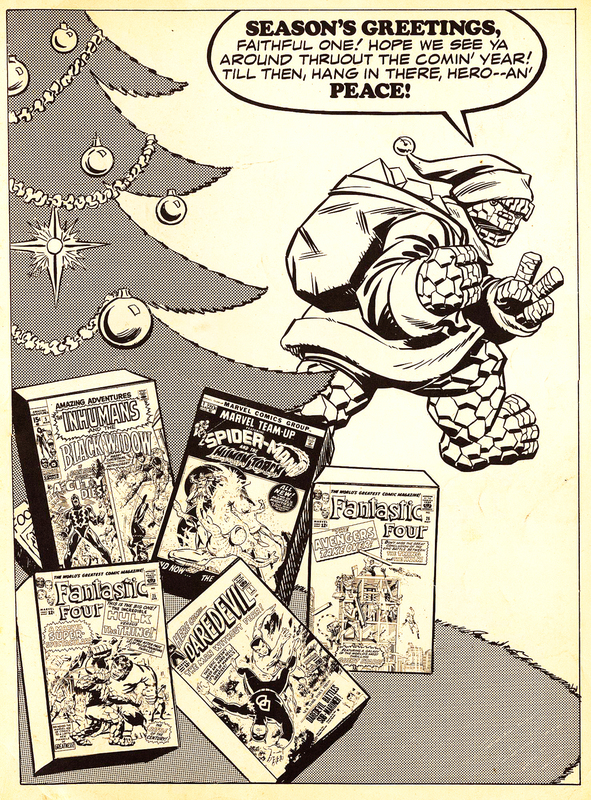 The Giant Superhero Holiday Grab-Bag was the very first Treasury I ever received and I clearly remember being mightily impressed by its giant size – such was the impression it made on me that 35 years later I still have that original copy. Two other Treasury Grab Bag’s were published in 1975 and 1976 but both were released under the Marvel Treasury Edition banner. 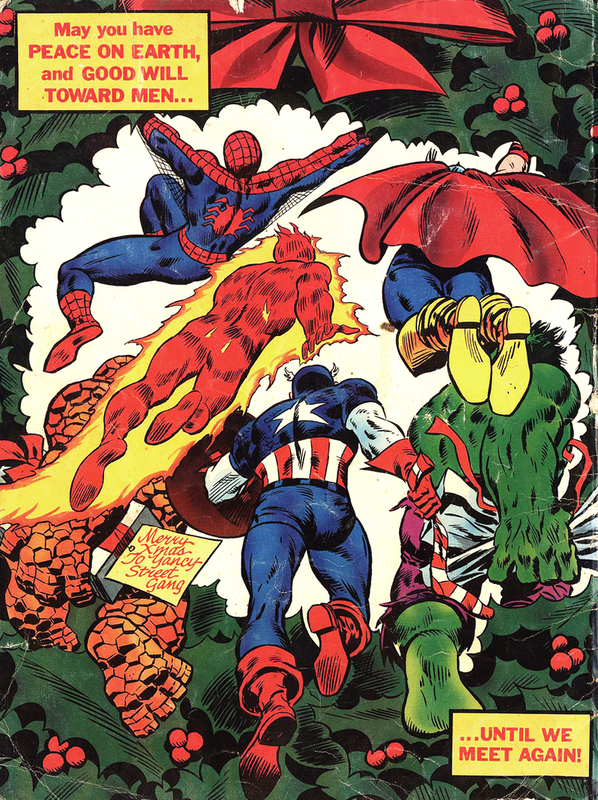 Only one other title was published under the Marvel Treasury Special banner: Captain America’s Bicentennial Battles from 1976, and I’ve looked at that collection here.